Double pushchair with reclining backrests. DescriptifSide by side double stroller for twins or closed-aged children with reclining backrests. Rented with 2 aprons (on request) and rain cover. 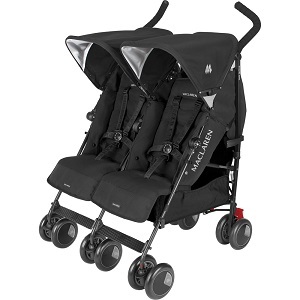 This MacLaren double stroller is suitable for twins or closed-aged children. It will help you enjoying your stay in Paris with your little ones. With its independent seats and backrests, it allows you to manage each needs: one child will be able to sleep on a reclined backrest while the second one will enjoy the visit. With its limited width, you'll be able to enter standard doors (shops, restaurants, museums...) in Paris. As all our products, we deliver it to your place (hotel, apartment rental, relatives) so that you may enjoy your stay in Paris the easiest way. This stroller is newly referenced within our baby equipment rental products, thus customer comments are not yet available.